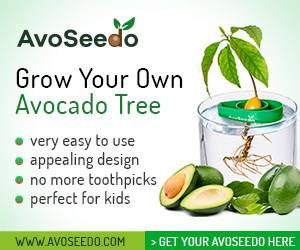 How To Keep Your Avocado Plant Alive - AvoSeedo - Grow your own Avocado Tree! Avocados are one of a kind, when it comes to fruits. They’re as tasty as they are healthy, and are a great addition to our diets. Yet buying them from supermarkets isn’t always ideal – they can be pretty expensive. So it’s unsurprising that many avocado advocates want to have a go at growing their own plants. 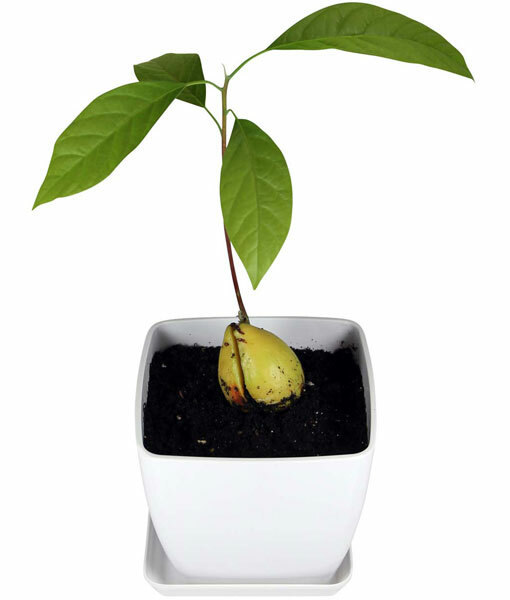 First you’ll need to decide on whether you’re going to plant your avocado tree outside or grow it in a pot. This depends on your location and the local climate. It’s important to consider the type of avocado that will grow best in your particular location. 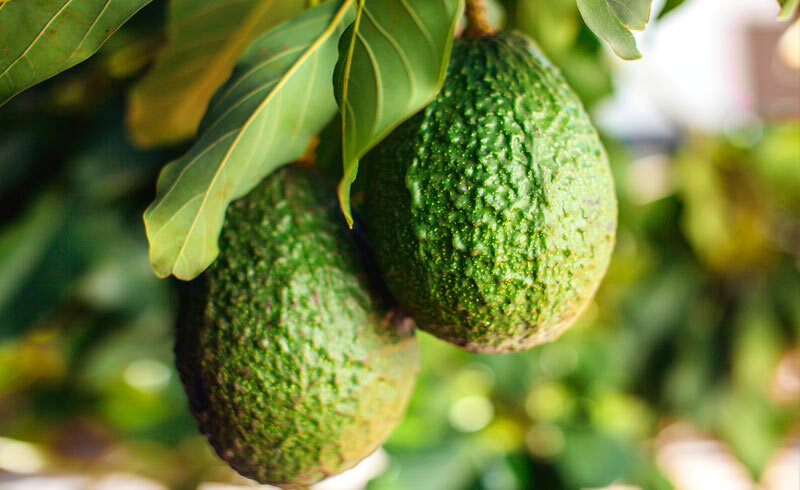 Growing an avocado plant (especially in a non-native climate) can be a challenge, but if you care for your plant with precision, there’s no reason why it shouldn’t eventually bring you delicious fruits. To plant or to pot? Ideally, you’ll plant your avocado tree. They tend to fare better when situated in a natural habitat: the ground. However, if you use a large enough pot and take special care of the plant, you can keep it alive this way for a few years. You may eventually want to plant it outside, anyway. If you’re living in a warm and sunny climate, you should plant your tree outside. A colder climate may be hard on your avocados, so perhaps you’ll want to pot them instead, keeping them inside for some of the time. For colder climates, go for Mexican or Guatemalan avocados. If there is a chance of freezing, go for Mexican avocado plants, as they’re the hardiest. Guatemalan avocados don’t fare as well with frost, and West Indian varieties need to be kept well clear of it. It’s also possible to grow hybrid plants (Mexican and Guatemalan) that can handle winters well. Mound soil up around your pot, so that it comes up to the level where the plant stem is sticking out of the soil. Pack the soil around the pot down enough that it becomes firm. For larger pots, you can place them in the ground up to around half of the pot’s depth. When choosing your location, consider that small, young avocado trees prefer plenty of shade. That’s because where growing naturally, they can often be found growing below the mother tree’s limbs. Conversely, larger, older trees can’t get enough of the sunshine. Although it’s not necessary to do a whole lot of digging, you do need to make sure you have a rich mound of soil. You can spade the ground to loosen it up if you wish. To lessen the likelihood of rotting roots, you can consider planting on a berm or a raised area. It’s important to remember that as your plant settles in, over time the trunk will be lower than it was at the beginning. If your tree is only a little one, you can protect it using a tomato cage. This is a good way to prevent birds, kids, and animals from damaging it. As the plants don’t fare well with clean, tough dirt, you would be better off using leaves and wood chips, which help to keep surface level roots cool and nourished. The majority of the feeder roots are situated within the top layers of the soil. Cultivated soil under the tree can disturb these surface roots. During the spring, summer and fall months, water your plant on a grass schedule. Note that the plant may dry out a little between watering sessions, so keep an eye on that. The kind of water you use is important too. For example, salt burn can be an issue for avocado plants. If there is a high salt concentration in the water, you’ll need to take measures for more precise watering. The same goes for when there is a lot of heavy clay in the soil. In these cases, you need to water your tree deeply and slowly. One way of doing this is to use drip emitters. Ensure that the maximum is set to between a quarter and a half gallon per hour. Then let this run for a few hours every time you water the plant. An alternative method to a drip system is a water hose on a minimal trickle. Again, you’ll leave this running for several hours. Either method will help the water to penetrate deeply enough that it reaches all the roots. In the cooler winter months, take extra care with your watering, so as not to allow the soil to become too cold and damp. If it is rainy in your location during winter, avoid watering your plant as much. If you did put a berm around your avocado tree, remove that in the winter so that rainwater can’t accumulate. 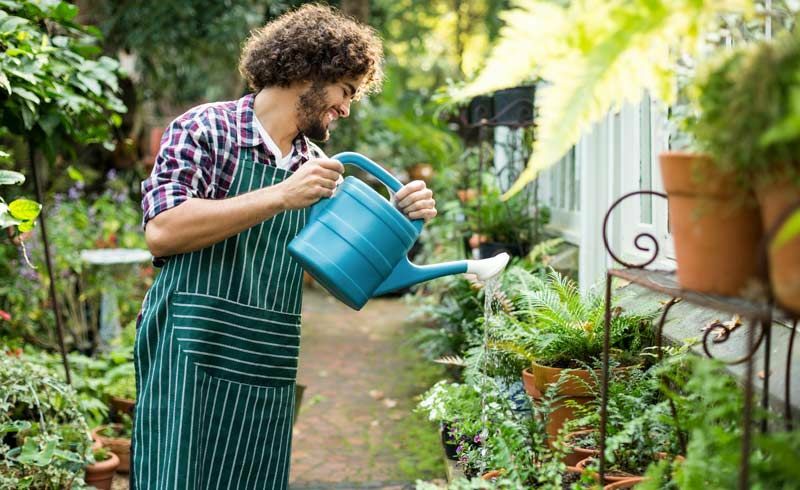 When digging holes in the ground, there can be issues with water getting into it, or the surrounding soil leaching water from the vicinity of your plant. Your avocado plant will need a lot of water, but equally there should be sufficient drainage. Avocado plants need to be situated in well-drained soil. When the soil is overly wet, root rot might take hold. It’s important to remember that even though your plant won’t want to be drenched at any point, neither will it tolerate drought conditions. If you’re living in an area that is very hot and dry, your plant must regularly receive plenty of water – at the deepest levels – so that it doesn’t die. This is especially true if your climate reaches temperatures above 100 degrees Fahrenheit. The first rule is not to over-fertilize your avocado tree, as this is likely to kill it. That’s because the most delicate roots (the feeder roots) are very close to the surface layer of the soil. To put that into perspective, know that it’s actually possible for your avocado tree to survive with no fertilizer at all. However, your tree can benefit from a properly diluted fertilizer solution. Note that if your avocado tree is young and you’ve only just planted it, you should stay away from fertilizer completely for at least a year. When it has started to thrive in its original conditions, you can think about putting some fertilizer on it. When you’re ready to use a fertilizer, go for a balanced citrus fertilizer. You need only do this once per year, as per the instructions on the product. Never go overboard with the fertilizer, as you really don’t need much. The last thing you want to do is kill your tree just as you’re getting somewhere! Organically-minded growers might prefer to go for a different kind of fertilizer. You can consider using coffee grounds, compost, or fish emulsion, which will all help your avocado tree to thrive. Although mature avocado trees prefer plenty of sun, they still need protection from it in their early years, when the bark is most sensitive. Once the root structure is fully developed and there is plenty of foliage around the plant, they will be more able to cope with strong sun. If your plant is going to be dealing with a lot of sunshine, you might want to paint the exposed bark with something like diluted (water-based) paint. Alternatively, you could plant it at the east side of your property, so that morning sun is the only sun it has to contend with. If your tree is not yet (but almost) at a stage when sun is welcome, you could build a kind of structure around it to keep it shaded until it’s ready. If you do this, make sure the plant has enough space to grow within it. It’s probably going to be a pretty tall tree, so take this into consideration. As we mentioned at the start of this article, some types of avocado plant will fare better than others in frosty conditions. If your tree is planted outside, that’s presumably because frosty conditions will be temporary in your location. If this is the case, you’ll need to have chosen one of the more frost-hardy types of avocado plant. We have written a detailed article on caring for your avocado tree in winter months and colder climates. Check it out for instructions on protecting your tree from frost and cold snaps. The last point we want to make before moving on to potted avocados is that pruning is only necessary when you need to limit height or spread. If you’re going to prune your tree, do so before a flower set and new growth flush. Once your Avoseedo has helped your pit to germinate, you should have a little plant of between 15 and 30cm. You can now plant this tree in soil. Loose and sandy are the key elements here. You can use a potting mix with compost blended with sand. This makes for a loose and fast-draining composition. You need fertile soil with good drainage capability. Alternatively, you could get a light potting soil (e.g. the kind used for cactuses). For better drainage (which is very important for growth), place a few stones on the bottom of the pot before you fill it with soil. For the first year, you can use a little fish emulsion for fertilizer. After that, you use a balanced fertilizer like 10-10-10 once per month. If your avocado tree is going to grow in a pot all its life, choose a 15 gallon unglazed terracotta pot with drainage holes in the bottom. Remember that it needs to be twice as deep as the roots. To give your plant the best chance of survival, first untangle any roots. In your soil, make a hole large enough for the avocado pit and roots. Then spread out the roots and fill the hole with soil, packing it lightly around the avocado pit. Make sure you leave the top half of your pit open, so as not to encourage rotting below the soil. Remember to turn your tree frequently to encourage even growth. When your potted avocado tree is still a baby, don’t place it in direct sunlight. It will need some light though, and as it grows more mature, you can move it into a brighter spot. As later it needs brighter light, you can move it to the sunniest window in your house. It may get straggly without adequate lighting. If you’re in a cold city like New York, consider getting a plant light during the darker season so that it won’t lose leaves. If you have the option to move it outside during the summer, do so. Don’t forget to bring it in when there’s any chance of frost though! Like outdoor trees, you can’t afford to overwater. Get yourself a moisture gauge, or test the soil with your fingers. Dry and crumbly soil needs water fast. Your leaves will tell you how much moisture is present too; yellow ones mean you’ve overwatered, and brown mean you need to water now. 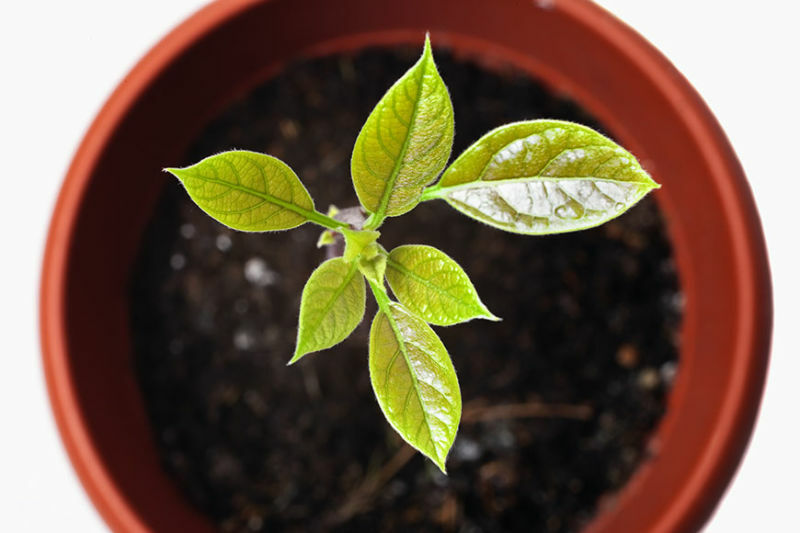 Your plant can grow indoors for three to five years after first sprouting. It can get quite large, so you will need to replant it in larger containers from time to time – perhaps every spring, but at least whenever the tree’s roots have filled the current pot. To repot, lay the current pot on its side, and gently roll the container around to help the root ball loosen up. Next, take the plant out of the pot. With your fingers, carefully loosen the root ball and untangle any roots. Next, place the root ball in your larger pot. Adjust the soil below the roots, ensuring that the plant sits at the same height as it was in the last pot. Pack soil around the root ball and then pour in water to the top of the pot, until it starts to drain out. Allow the soil to dry before watering the plant again. Be careful when repotting from within a large pot. The root ball could fall apart, killing your tree. If you want your tree to live for many years, aim to pot a 1 to 5 gallon tree into the ground outside, if possible. That’s about it. We wish you the best of luck in planting or potting your avocado tree. May it live a long and prosperous life, bringing you the most delicious fruits possible! This entry was posted in All about Avocados, Gardening. Bookmark the permalink.